This dreary winter weather has a lot of people down. It’s time to get out and have some fun indoors. At Redmond Town Center, we have lots of activities planned for our Northwest Neighbors. 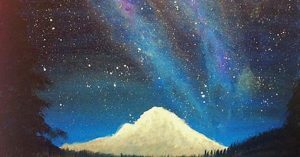 Coming up next week is a Paint & Sip Party at The Painted Palace. Purchase your tickets today to reserve your space. Here’s all the details! Don’t forget to stop on by Thai Ginger before your class. We have a variety of delightful winter dishes to warm and soothe your soul. Here are two of Redmond’s local favorites. 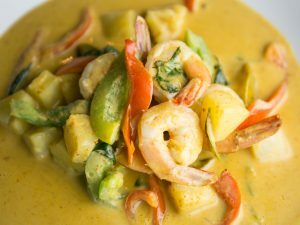 This cold-weather favorite is loaded with jumbo prawns and fresh kabocha squash and red peppers dressed in a lovely pool of spicy panang curry with sweet basil. Comes with your choice of brown or white Jasmine rice. 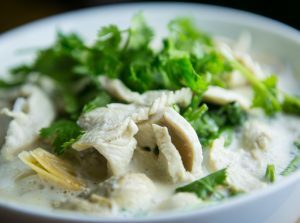 One of Redmond’s most requested dishes, this traditional hot & sour soup is simmered with coconut milk, galangar, mushroom, lemongrass, lime leaves and cilantro. Choose your choice of protein or go totally vegan.